VIDEO: The newest Doctor Matt Smith and his Inverness-born assistant Karen Gillan are at Eden Court Theatre. The new Dr Who and his Scots assistant are travelling through time to visit Inverness as part of a whistle-stop tour on Tuesday. Actors Matt Smith and Inverness-born Karen Gillan are presenting the first episode of the new series at five locations. Smith is the 11th actor to play Dr Who in the popular BBC sci-fi show. The pair have also visited Belfast and will next be in Sunderland, Salford, and Mr Smith’s home town of Northampton. The tour will introduce the 11th doctor and his companion to fans of the show and offer them a chance to meet the stars at Eden Court Theatre on Bishop's Road. 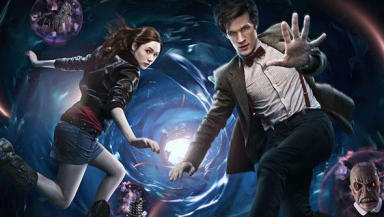 Each location is hosting a regional premiere of episode one, The Eleventh Hour, for local children. The actors are travelling on a specially-themed Doctor Who tour bus, featuring the new Tardis logo. They are joined on the shoot by Caitlin Blackwood who also features in The Eleventh Hour. BBC Wales head of drama Piers Wenger said: “This is a great opportunity for the new doctor and his companion to interface directly with the people who matter most to Doctor Who, the fans.